*Log hives are the most widely used in Africa. *They are inexpensive to make. *They can be produced locally and require little knowledge of carpentry. *They can house large amounts of bees. *They are the best hive if one is looking to get large quantities of wax. *When occupied, these hives are very hard to steal due to many cracks and openings that bees utilize to protect their colony. *Log hives are difficult to work with. *The bees can pull their comb from any direction (lengthwise from one end to the other or perpendicular to the hives body). *The comb is “all” fixed to the top of the hive. *Removal of the comb for inspection is impossible. *All of the harvested comb needs to be handled from the bottom and sides dirtying the honey in the process. *These types of hives are very hard to circulate smoke through. *Due to large gaps and cracks, log hives allow more pests (large and small hive beetles, wax moths) in the hive body. * Any log hive that is jarred while lowering to the working surface will lose its honeycomb. The weight of the heavy comb causes it to break off and pools honey on the bottom of the hive. Lots of honey is lost in this process. *All the comb is often removed during harvesting thus losing the bees that have worked so hard to produce the honey and wax. *When harvesting from these hives the brood chamber is left undisturbed. 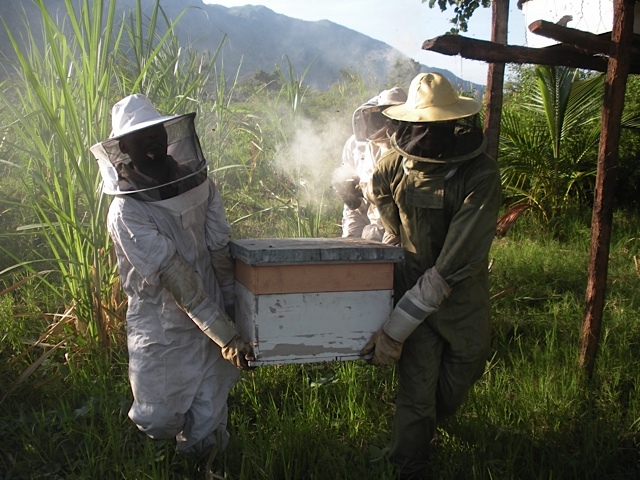 This ensures that a workforce will be present to produce again next honey flow. *These hives are becoming more popular (but used by less than 10 percent of African beekeepers). *These hives can hold large numbers of bees and produce good quantities of honey. *The honey is of excellent quality. 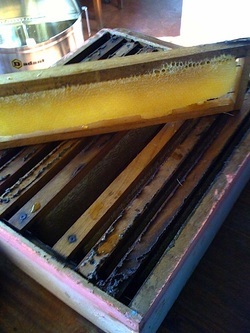 *The combs are all fixed to individual bars, making the hive easy to inspect and to harvest the honey. *The hive is tightly constructed with controllable entryways, making it easier for the bees to police and keep pests from entering. *The hives are easy to smoke. *These hives most resemble the cavities that African bees naturally build in. *They usually cost between 20-35 dollars to make. 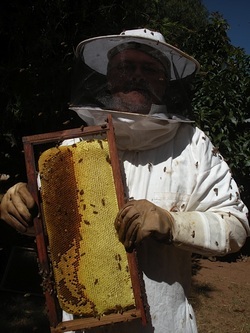 *The comb hangs from bars but is otherwise not supported, making it difficult to move these hives about as well as making the comb more difficult to inspect. As the comb gets larger it becomes more fragile and susceptible to breaking. *These hives require more expertise in their construction. *These hives are “usually not” made to add on additional rooms/supers for increasing the amount of brood or honey. *These hives are not as well insulated from the heat as a log hive. *It takes at least 12-15 minutes to harvest honey from a top bar hive. *Due to having one entryway these hives are easy to steal. A simple piece of tape or plug over the entryway effectively stops bees from protecting their colony. They can be carried off easily. *These hives are capable of producing the largest amount of honey. By returning harvested framed comb to the hive, it is possible to harvest twice during large nectar flows. *These hives are very movable because the bees’ comb is in fixed frames. The hive can be bounced gently and even trucked from one destination to another. *These hives are the easiest to inspect the comb and harvest the honey. *These hives are the quickest to harvest honey from since an entire super/chamber of honey is removed at once. A definite plus when working with African bees! *The brood chamber, which is under the honey super is left undisturbed, ensuring that a workforce will be present to produce again next honey flow. 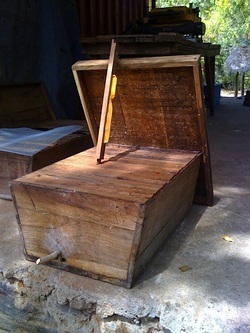 *Only 2 percent of African beekeepers use this type of hive, making it an unknown and little under -stood hive. *Langstroth hives are the most expensive hive to construct (hive with one honey chamber/ super usually costs between 120-150 dollars). *Langstroths are very challenging to construct, requiring a skilled carpenter. *Langstroths require wire, nails, tin and other materials not needed in Log or Top Bar hives. *Honey must be spun or extracted from these hives with a centrifuge-type extractor. *These hives produce very small amounts of wax since the comb is seldom harvested but rather returned to the hive. Therefore, a few log hives are needed to get wax for baiting new hives for the next year. *The cavities of these hives least resemble what a natural African bee colony would build in.